Disney has released a brand new teaser for Wreck-It Ralph 2. To help ring in the new year, Disney decided to release a brief new teaser for the highly-anticipated animated sequel. While the teaser doesn't offer much in the way of new footage, we do get to see Ralph back in action, busting his way into 2018. It also serves as a nice reminder that Ralph Breaks the Internet: Wreck-It Ralph 2 is finally coming out this year. "This year he's going to break it #RalphBreakstheInternet"
Some footage from Wreck-It Ralph 2 first debuted last summer at Disney's D23 Expo, with some footage making its way online, but we've yet to see an actual teaser trailer released. 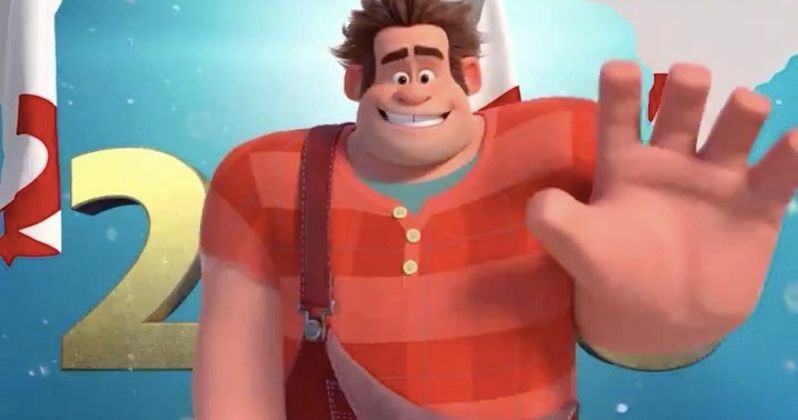 Since the movie isn't scheduled to arrive in theaters until November 21, it's likely we probably won't see one for a few months, but Disney is clearly ready to start getting fans excited about the prospect of seeing Ralph wreck-it once again. This time around, Ralph and Vanellope, now good friends, discover a wi-fi router in their arcade, leading them into a new adventure that goes far beyond the world of video games. As the title implies, they're going to traverse the internet and, also as the title implies, they're going to break stuff. Ralph Breaks the Internet: Wreck-It Ralph 2 takes place 6 years after the events of the first movie and will feature some returning favorites as well as some brand new cast members. At D23, it was revealed that virtually every Disney Princess in history is going to have a cameo in the movie in one epic scene. Also, C-3PO and R2-D2 will be along for that ride. That's what can be done when Disney owns everything. Phil Johnston and Rich Moore co-direct Wreck-It Ralph 2, with a script from Pamela Ribon. John C. Riley, Sarah Silverman, Jane Lynch and Jack McBrayer all return to reprise their roles from the first movie. Is six years a bit too long between animated sequels? Disney has also taken their time with Frozen 2 as well, so they don't seem to be concerned about the audience losing interest, despite quite a bit of time passing between installments. Wreck-It Ralph was released in 2012 and was a critical and commercial success. The first Wreck-It Ralph movie currently has an 87 percent approval rating from critics on Rotten Tomatoes and grossed $471.2 million worldwide, working from a $165 million production budget. Disney will have some stiff competition for the sequel, as Creed 2, another highly-anticipated sequel, is slated to arrive on November 21. Then again, those movies are probably going for pretty different audiences. Be sure to check out the new teaser for Ralph Breaks the Internet: Wreck-It Ralph, courtesy of the Wreck it Ralph Twitter, for yourself below.